Chicken wings, a game day classic, are something I like the taste of but do not like to serve because I do not like to see a bunch of people milling around collecting little piles of bones on their plates! 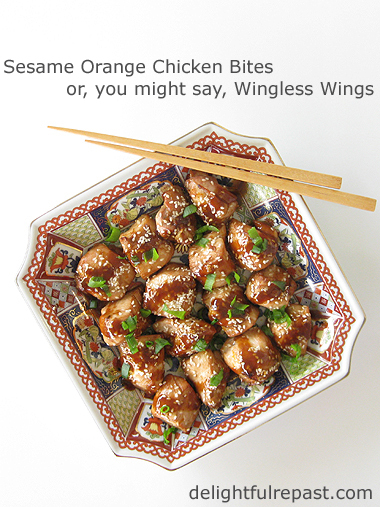 So I wanted to make something wing-like but boneless. I like to call them Wingless Wings. It seemed like boneless skinless chicken thighs would be ideal for something like this because of their ability to retain moisture, but there is one drawback. They're quite irregular in shape, very flat in places, so they really don't make very attractive or even remotely uniform pieces. Boneless skinless chicken breasts can be cut into much more attractive bites, so that's what I recommend. Mr Delightful isn't a chicken wing man (or even a wingless wing man), so I served it to him on a bed of rice with a side of broccoli for dinner. He liked it! 1 In 1.5-quart lidded bowl, whisk together soy sauce, vinegar, honey, orange zest and juice, shallot, fresh ginger, curry powder, sesame oil and cayenne pepper. 2 Add chicken pieces, coating well. Refrigerate, covered, and let marinate for 6 to 24 hours. 3 Preheat oven to 425F/220C/Gas7. Broiling would probably work well, but I didn't want to put my best half sheet pan under the broiler and my second-best was on duty elsewhere. 4 Remove chicken from marinade and pat thoroughly dry. Spread out the pieces on a foil- or parchment-lined rimmed baking sheet (a half sheet pan is perfect). Note: I did not toast the sesame seeds because I thought they would toast sufficiently in the oven. They didn't, so next time I will definitely toast my sesame seeds first. 6 Strain marinade into small saucepan. Bring to boil; boil gently for 10 minutes (very important to kill raw chicken germs!). Reduce heat and continue simmering a couple of minutes, stirring in an additional tablespoon of honey, if desired. Remove from heat, cover and let stand till chicken is done. 7 Reheat. Taste and adjust seasoning (I added just a pinch of cayenne). If it's not as thick as you'd like, dissolve a teaspoon of cornstarch in a minimal amount of water and stir it into the sauce a little at a time. 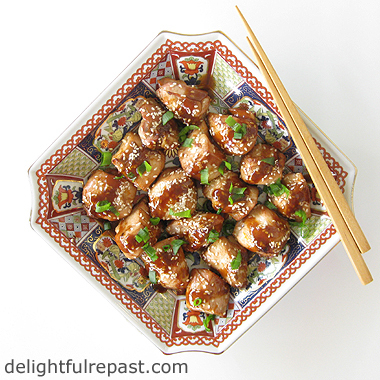 8 Place chicken bites on serving dish, pour on as much sauce as you'd like; serve the extra sauce in a bowl. Garnish with some finely sliced green onions. Brownie Bites take a little more effort than a pan of Brownies, but I think it's worth it for two reasons. First, every single brownie is one of the coveted "edge" brownies with the extra chewy exterior. And, second, they're cuter! Like most people, I'm very particular about the texture of my brownies. Some people prefer a cakey brownie; and if you are one of them, go back to Google and keep looking! I'm a chewy brownie fan. Chewy, but not gooey (gummy). The most important thing when baking brownies, or brownie bites, is to not overbake them. Watch them like a hawk! Don't underbake them either, but watch for them to just be the perfect degree of doneness. 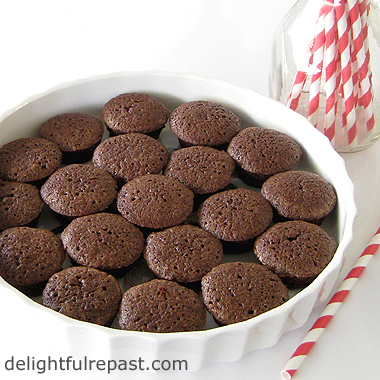 This recipe makes exactly 24 mini-muffin brownie bites. If you have enough tins, double the recipe and make exactly 48; I'm sure they freeze beautifully. How do you like your brownies? Or are you more of a blondie fan? Do you like them best with coffee, tea or milk? One could, of course, decorate these any number of ways, but I wanted to show you the basic brownie bite. * I buy organic and Fair Trade Certified coffee, cocoa and chocolate products. 2 In small bowl, whisk together flour, cocoa, baking powder and salt. 3 In 1-quart glass measure, microwave butter for 1 1/2 minutes, or until melted. Stir in sugar, vanilla and espresso powder. Add eggs, one at a time, beating well after each addition. Add flour mixture to wet mixture; beat until well blended. 4 Using a measuring tablespoon, spoon batter into muffin tin(s). Then go back with a measuring teaspoon and do the same. In other words, divide the batter evenly between the 24 mini muffin cups, filling quite close to the top. 5 Bake for about 17 minutes, or just until brownies begin to pull away from sides of pan or test moistly done with a toothpick or ... well, you'll sort it out. Do not overbake. I'll say that again: Do not overbake. Turn out onto wire rack, and cool completely. 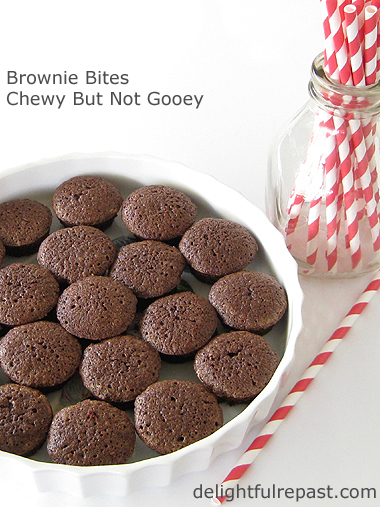 Brownie bites will keep for several days at room temperature in airtight container with wax paper between layers. 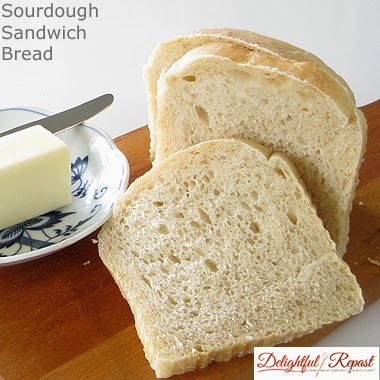 This sourdough sandwich bread is a classic wild yeast sourdough bread, meaning it is made without the addition of commercial yeast. While I love the gorgeous crusty round loaves of sourdough artisan bread baked free-form, for mornings we need a loaf that will make tidy slices that are a perfect fit for the toaster. And this bread makes the best grilled sandwiches ever! It takes longer to read about it than it takes to make it! Less than a minute for first starter feed, less than a minute for second starter feed, a couple minutes to stir up the dough, a couple minutes to shape the loaves. The rest of the time, it's doing *its* thing while you're doing *your* thing! You could use 9x5x3-inch loaf pans, 23x13x7cm, but I use this equivalent 9x4x4-inch pullman loaf pan (without its lid). Until this month I had just one of them. But it was getting to be a bit much baking a single loaf every three days, so I got a second pan. Just freeze one loaf until the first is gone. 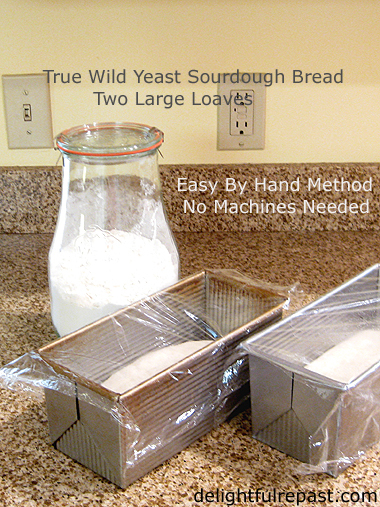 If you don't already have a sourdough starter, here's How to Make Your Own Sourdough Starter. 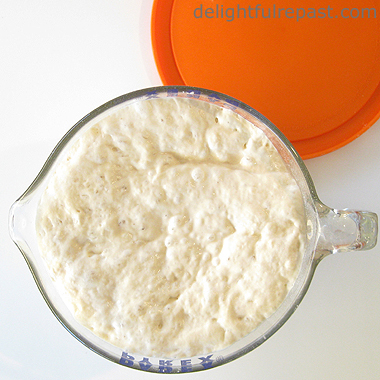 No need to buy a sourdough starter! It's really simple. All it takes is unbleached all-purpose flour (preferably organic), filtered or bottled water (not distilled or chlorinated tap) and lots of patience. But your patience will pay off. If you don't have a digital kitchen scale, do get one. It will greatly simplify your baking life, especially for bread, especially if you are new to bread baking and so don't yet have a "feel" for how much flour the dough needs. You are less likely to add too much flour to the dough when you weigh rather than measure. Note: These directions have you giving the starter the first of two feedings the night before the day you plan to bake the loaves. 1 Feed up your starter to 3 cups: Take 4 tablespoons starter out of refrigerated storage container. Put it in a 4-cup glass measure. Stir in 1 cup flour and 3/4 cup (6 fluid ounces) water. Stir vigorously, put 2 tablespoons of it in your jar of stored starter, cover loosely and let stand at room temperature overnight, about 8 hours. Leave storage jar at room temperature as well. Note: My starter storage jar is just a half-pint canning jar, and it's not even full. Contrary to popular opinion, there is no need to keep huge quantities of starter. 2 In the morning (about 5:00 a.m. for me), stir down the starter and add 1 cup flour and 3/4 cup (6 fluid ounces) water. Stir vigorously, put 2 tablespoons of it in your jar of stored starter, cover loosely and let stand at room temperature until the starter is ready to use (in this case, 3 hours). This varies due to many factors, including the maturity of your starter; so give it the float test about every hour to see if it is ready to use. Leave storage jar at room temperature as well. Float Test: Drop a teaspoon of starter into a glass of water. If it floats, the starter is ready to go. If it sinks, check again every hour. After a few times, you will see a pattern emerge and be able to plan your day accordingly. 3 Weigh your flour in a 2-quart bowl. Stir down fed starter and put all but about 2 tablespoons of it into a 4.5-quart mixing bowl. Add the 2 tablespoons of starter to your storage jar, stir vigorously and refrigerate. With a dough whisk or large spoon, stir in water, salt and flour (holding back 1/2 cup of flour until the end, as it may not be needed if your measured flour wasn't precisely 30 ounces or the humidity level is different, etc). Stir until it just comes together into a shaggy dough (fairly stiff, but still sticky). With one hand, knead dough right in the bowl, just enough to incorporate all the flour and smooth it out. 4 Divide the dough into two equal portions (again, the digital kitchen scale comes in handy here), and place them in two lightly oiled bowls. 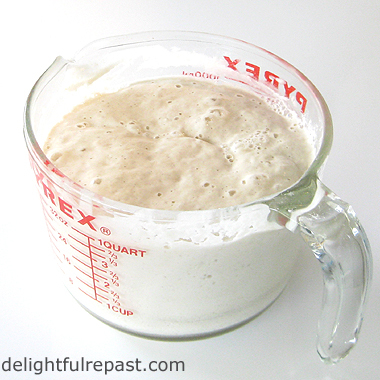 I like one of them to be my Pyrex 2-quart glass measure so I can easily see when the dough has doubled. Cover both loosely with lids or oiled plastic wrap or lid and let stand at room temperature until dough has doubled (in this case, 7 hours). The time will vary; after a couple times you'll know about how long this might take and be able to schedule your day accordingly. Note: Or you could let all the dough do its first rise in one bowl, then divide the dough when it's ready for shaping and second rise. 5 Grease (I use just a little olive oil, about 1/2 teaspoon each) the bread pans, either 9x4x4-inch pullman pans without their lids or 9x5x3-inch loaf pans. 6 Using no more than a tablespoon or two altogether for both, sprinkle countertop with some flour. Gently scrape the first batch of dough onto the floured countertop. Sprinkle with flour. 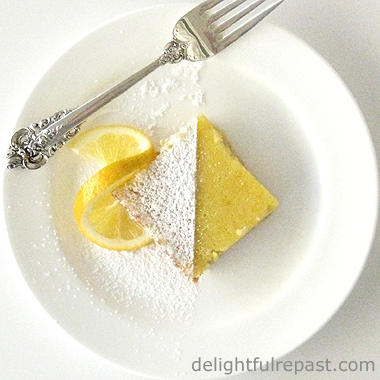 Press each portion gently into a roughly 12-by-8-inch rectangle. 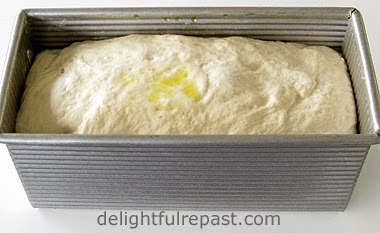 Using a bench scraper, if needed, roll the dough into a loaf. With the bench scraper, place dough in the pan, pressing it into the corners. Brush on a little water. Cover it loosely with an oiled or cooking-sprayed piece of plastic wrap. 7 Let rise until doubled. If using 9x5x3 loaf pans, it should rise an inch or two above the rim of the pans. If using 9x4x4 pullman pans, the dough should rise to just a little above the top of pans. This can take anywhere from 3 to 5 hours. The dough needs to rise until the dough doesn't quickly spring back when poked with a floured finger or knuckle. Today I felt like helping it along a bit after that long first rise in my cold kitchen, so I turned the oven to 200F/93C and left it on for 2 minutes, counting from the time the oven lit, then turned it off and placed the pans in the oven. Tip: Check on the dough's progress regularly. After making it a few times, you'll have a better idea of how long it will take. And that will change as the weather changes. I keep my house rather cool in winter, so sourdough bread takes much longer to rise now than it does in summer. 8 Toward the end of the rising time, preheat oven to 450F/230C/Gas8. Just before baking, brush the loaf with a little water. 9 Bake at 450F/230C/Gas8 for 10 minutes. Reduce heat to 400F/205C/Gas6 and continue baking for about 30 minutes or until crust is beautifully golden and middle of a loaf registers 210F/99C on instant-read thermometer. Tip: For reasons I won't go into (something about lactobacilli and yeast and ...), sourdough bread sometimes doesn't brown as well as other breads until your starter matures. 10 Remove from pans and let cool on wire racks for 1 1/2 to 2 hours before slicing. I guess there's no use denying that I'm a tea snob. And, when traveling, no self-respecting tea snob would ever drink tea made in a coffee maker in the room. And I don't want to wait till breakfast to have my first cup of the day. And who knows if that's going to be up to standard! The answer I came up with on my last trip was: a tea travel kit. The question: which kettle? It seems most are made of plastic, and that just won't do. A few hours of research led me to the Bonavita Dual Voltage 0.5L Electric Travel Kettle and convinced me that it's the kettle for me. Perfect for the person who is the lone tea-drinker in the office, it could also be used in a college dorm room, RV or boat. And for pour-over coffee as well as tea. Hmm ... I do happen to have a 0.5L French press. The Bonavita Dual Voltage 0.5L Electric Travel Kettle is stainless steel, no plastic in contact with the water. It is compact, lightweight, easy to use and has auto shutoff after boiling. Dual voltage means it works anywhere; just take along an adapter plug and a coin for turning the button on the bottom of the kettle to the voltage required. At 0.5 liters, it's just big enough to make 2 cups of tea, but my husband isn't quite as desperate for his morning cuppa as I am, so I put together my kit just for me. A mug setup is much simpler for travel purposes than a teapot, cup and saucer; so here's what I put together. Update 03/18/19: These Amazon links are to the non-dual voltage version as the dual voltage version is not currently on Amazon. Here is a link to Bonavita Dual Voltage Kettle at the Bonavita site. 2 A mug and infuser for loose leaf tea. Like this ForLife Curve Tall Tea Mug with Infuser and Lid. Or whatever mug and strainer you are already using at home. 3 A small tray that is big enough to hold the kettle, mug and whatever else you might want to put on it AND small enough to fit into your bag. My tray is 11x7 inches/28x18cm. 4 A leftover tea tin into which you've measured the amount of tea you think you'll need for the length of trip you're taking; and don't forget the measuring spoon. Or just take a tin of teabags. 6 A bag to hold everything. Like the squishy and easily packable Thermos Raya Duffle Lunch Bag, which was available at my local Target in only a riotous multi-colored pattern, so I ordered this tamer one from Amazon. A soft cooler is not needed for this purpose, but it happened to be the right size and shape. Between trips, I can use it for lunch. Having along one of my major comforts of home makes travel much more enjoyable. How about you? 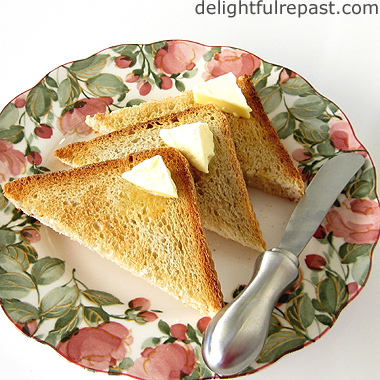 Do you take along tea or coffee kits or any other comforts from home when you travel? 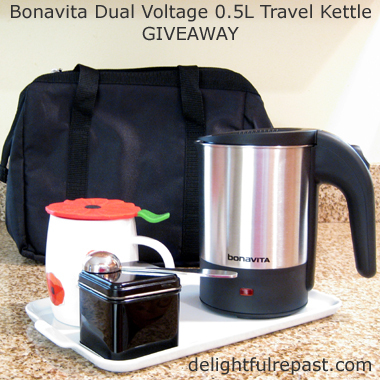 Since January is National Hot Tea Month, I thought I'd celebrate by giving away a Bonavita Travel Kettle! Update 01/11/17: The giveaway is now closed. This giveaway is open to US residents* 18 years of age or older. Leave a comment below (one entry per person) that includes where you want to take your Bonavita Travel Kettle. Please include your email address in the body of your comment. Must enter by 11:59 p.m. Eastern time Wednesday January 11. * If you are outside the US but would like to have this sent to someone in the US (you would have to send them a gift card separately on your own), go ahead and enter! Winner will be chosen by random drawing and be announced here in the comments before noon Eastern time on Thursday January 12. If I don't hear back from the winner of the random drawing by noon Eastern time Sunday January 15, another drawing will be held and a new winner selected from the original entrants (those who commented before the giveaway deadline). 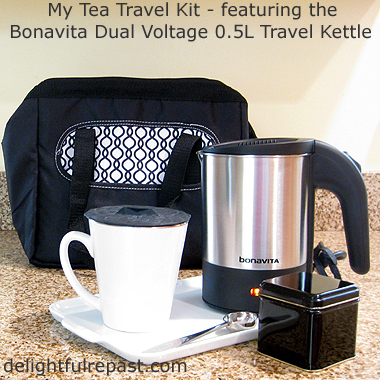 Disclosure: Bonavita provided a kettle for review purposes and one for the giveaway. I received no compensation. The views expressed here are entirely my own. I always tell my readers what I really think!